Only 6 days left in tax season! Extensions â€“ and when you donâ€™t have the money to pay the tax. What to do when your state is holding refunds. First individual estimated tax payment is due April 15. First calendar corporation estimated tax payment is due April 15. Last chance to make an IRA or Roth contribution for 2009. Remember second California real estate tax payment is due April 10. First time homebuyer credit expires April 30. California adopts tax credits for home purchases. Health Care Reform includes tax changes. Jobs Act includes tax changes. How do I calculate my mileage if I donâ€™t have a workplace? Please explain the exclusion for gifts to a child. Follow me on Twitter, Facebook and LinkedIn. Happy Easter! My wife, Janet Gray, grandson, Clive Baker, and daughter, Holly Baker. Only 6 days left in tax season! Time to think about extensions. There isnâ€™t enough time left to give preparing tax returns the attention they deserve, but we can help a few more new clients with extensions and finish their returns later. To make an appointment, please call Dawn Siemer on Monday, Wednesday or Friday at 408-918-3162. April is a big birthday month for my family. My daughter, Dawn Siemer, her husband, John, and daughter, Kara, all celebrate birthdays very close together. Kara will be celebrating her third birthday. My mother, Eleanor Gray, is celebrating her 88th birthday. Thank God she is still fairly healthy and thinking clearly. With the end of tax season, Easter and birthday celebrations, itâ€™s going to be a busy month. My sister, Virginia Allison, passed away at age 66 last Friday, April 2, after a long fight with cancer. She had a pretty good quality of life until the last year, and was planning to go to Disneyland with my nieceâ€™s family last November, but her health failed and she just couldnâ€™t make it. She will be sorely missed. She was married since her teens to her husband Wade. 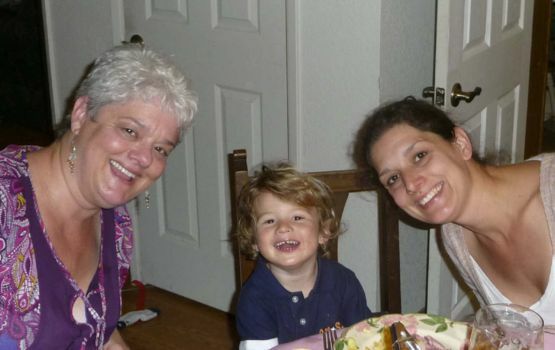 They had three children, two living, and four grandchildren who adored her. We will all miss her very much. Extensions - and when you don't have the money to pay the tax. What do you do when you don't have the money to pay the tax? My first recommendation is to file your income tax returns, certified mail, by the initial filing date. One of the nastiest penalties in the IRS's arsenal is for late filing - 5% per month to a maximum of 25%. Some people who owe money don't file their returns because they are afraid. THIS IS A HUGE MISTAKE! The best approach is to be honest about your situation and work with the tax authorities to resolve it. When you file an extension, any balance of tax due when the tax return is filed represents an exposure for the late filing penalty. Please don't misunderstand me. I regularly use extensions for my clients and myself as a workload "safety valve." We often don't have the information to complete a return by the due date. They just aren't appropriate when there will be a significant balance due that won't be paid by the original filing due date. Remember the automatic extension of time to file for 2009 individual income tax returns is for six months to October 15, 2010. If you have filed an income tax return for 2008, you can process your federal extension electronically (using tax return preparation software or through a tax return preparer). If you make a tax payment using a credit card, you can extend your income tax return by calling 888-729-1040 or 800-272-9829 by April 15. (For California extension payments, the extension is 1555.) Better call early to beat the rush! Mailing a paper form is still acceptable and is the only way a person who didn't file a 2008 income tax return can request an automatic extension. You can also make a credit card payment online at www.pay1040.com or www.officialpayments.com. California also has a web payment option at www.ftb.ca.gov. A taxpayer can still avoid the late filing penalty by demonstrating a "reasonable cause," but this can be a hassle and the taxpayer is at the mercy of the subjective judgment of a representative of the tax authority. Should you borrow using a margin account? In most cases, this is not a good choice because of the exposure to margin calls if the market declines. Should you use an equity advance loan, secured by your principal residence? In some cases it might be to your advantage, if you can get a favorable interest rate. Remember that interest for an equity loan not used for a home improvement is only deductible on a loan amount up to $100,000. This interest is not deductible when computing the alternative minimum tax. The IRS has a form for installment agreements, Form 9465. They would prefer that you submit the form with your income tax return. You can take up to five years to pay off your tax liability. An advantage of arranging an installment agreement is the penalty for late payment of tax is reduced from 1/2% per month to 1/4% per month. In addition to penalties, interest is charged for late tax payments. The interest rate is adjusted quarterly. Recently, the rate has been eight percent. Although it may provide relief from your other creditors, bankruptcy doesn't offer much help for recent debts for income taxes. When you make payments on your tax bill, be sure to specify to apply the payments to taxes due. Penalties and interest are dischargeable in bankruptcy, but income taxes aren't. It may be to your advantage to plan how to use regular tax or alternative minimum tax capital loss carryovers or minimum tax credit carryovers. You might need to generate capital gains, which can be difficult when you're in financial distress. Some states, such as Hawaii, are holding refunds due to the current cash crunch. Consider making an arrangement to apply the overpayment to next yearâ€™s estimated tax and reduce your withholding at work or next yearâ€™s estimated tax payments. Remember to review your estimated tax situation for 2010. There is no estimated tax penalty provided the taxpayer pays at least 90% of the tax (including AMT) on the current year's tax return through withholding and/or equal quarterly estimated tax payments. Remember California now requires 30% of the estimated tax liability to be paid for the first quarter of 2010, 40% for the second quarter, none for the third quarter and 30% for the fourth quarter. Calendar-year Corporations almost always have to pay the minimum California tax payment of $800 by April 15, 2010. In addition, regular corporations have federal and California estimated tax payments due on that date. The estimated tax payments may be based on the income tax on last yearâ€™s income tax returns, provided there was a tax on the return. If there was no tax, the estimated tax must be computed based on the current yearâ€™s income. Corporations that had taxable income exceeding $1 million in any of the last three years may only base their first estimated tax payment on last yearâ€™s income tax returns; the rest must be based on the current yearâ€™s income. Remember the final due date for IRA and Roth contributions for 2009 is April 15, 2010. We donâ€™t think making an election to have a tax overpayment deposited to an IRA or Roth account is a good idea for income tax returns filed during the last two weeks of tax season. Itâ€™s too easy for a refund to be delayed past the due date. With the income tax deadline, most of us are focused on April 15, but the second California real estate tax payment is due April 10, and there is a nasty penalty for a late payment. Consider yourself reminded! Remember that the federal First-Time Homebuyer Credit is scheduled to expire April 30, 2010. The credit actually applies to a closing date of June 30, 2010 provided the contract of sale is in place by April 30. Individuals who owned a home for five of the last eight years are also eligible for a credit. For details go to www.realestateinvestingtax.com/first.shtml. California has enacted AB 183, which includes tax credits for first-time homebuyers and taxpayers buying homes that have never been occupied. The credits are the lesser of 5% of the purchase price or $10,000. The credit applies for taxpayers who purchase a "qualified principal residence" on or after May 1, 2010 and before January 1, 2011. The credit will also apply if a contract is in effect on or after May 1, 2010 and before January 1, 2011, provided the sale is completed by August 1, 2011. Itâ€™s possible for both the federal credit and a California credit to apply to the same home purchase. The credit applies over a three-year period, beginning with the year in which the qualified principal residence is purchased. The credits are not refundable, do not reduce AMT, and canâ€™t be carried over. As you know, Congress has passed and President Obama has approved significant health care reform legislation. There are a number of tax provisions in the legislation that I donâ€™t have time to discuss in detail. One is an increase of the Medicare tax on high-income taxpayers, including a tax on investment income! The 3.8% tax wonâ€™t take effect until 2013. It applies to individuals with adjusted gross income of $200,000 for singles, $250,000 for married filing joint returns. A 0.8% additional Medicare payroll tax will also apply. For details see my blog post at michaelgraycpa.com/2010/03/29/health-care-act-includes-big-medicare-taxes-for-high-income-taxpayers/. For 2010 through 2013, eligible employers may qualify for a sliding-scale tax credit of up to 35% of their contribution to employeesâ€™ health insurance premium. Eligible small employers have no more than 25 employees and average annual wages of less than $50,000. For 2014 and beyond, eligible employers who purchase coverage through an insurance exchange may qualify for a credit for two years of up to 50% of their contribution. Salary reduction contributions are not counted. Cafeteria plan rules are relaxed to encourage more small employers to offer tax-free benefits to employees. Beginning in 2018, a 40% nondeductible excise tax will be imposed on insurance companies or plan administrators for any health insurance plan with an annual premium in excess of an inflation-adjusted $10,200 for individuals and inflation adjusted $27,500 for families. The tax will apply to the amount in excess of the thresholds. Effective for tax years beginning after December 31, 2012, the threshold for the regular tax itemized medical deductions will be increased to the same as for the alternative minimum tax from 7.5% to 10%. The threshold increase will be postponed for individuals age 65 and older and their spouses until after 2016. The exclusion for family health care benefits will apply to adult children under age 27. The deduction for health insurance for self-employed individuals will also apply to this coverage. Starting in 2014, monthly penalties will apply to individuals not eligible for Medicaid, Medicare, other government-sponsored coverage or other exemptions who donâ€™t have health insurance coverage. President Obama signed the Hiring Incentives to Restore Employment Act on March 18. The Act includes some important tax incentives. The employerâ€™s part of Social Security tax of 6.2% of an employeeâ€™s taxable wages up to $106,800 is waived for covered workers on the employerâ€™s payroll after March 18, 2010 and before January 1, 2011. The covered employee must begin employment after February 3, 2010 and before January 1, 2011. The covered employee canâ€™t be hired to replace another employee of the qualified employer, unless the other employee voluntarily quit or was terminated for cause. The covered employee may not be related to the employer. Household employers are ineligible for the credit. In order to qualify, the employees must certify they were unemployed during the 60 days before beginning work, or that they worked fewer than a total of 40 hours for another employer during the 60 day period. The IRS is developing a form for employers to use for the certification. Remember, Medicare tax still applies! The increased $250,000 expense election limit, which had expired at the end of 2009, has been extended through December 31, 2010. The investment limitation up to $800,000 before the expense election is phased out has also been extended. April 14, Lori Greymont of Summit Solutions Team Corp., "Real estate investment strategies I"
April 21, Lori Greymont of Summit Solutions Team Corp, "Real estate investment strategies II"
If you are an employee for a construction company and you are sent to different "temporary work location" job sites daily, can you deduct the mileage from your home to the work location? Does the "shop/office" qualify as a permanent work base even though you never actually report to the shop/office? Is a 60-mile commute each way outside your "metrpolitan area"? If you never go to the shop or office, I suggest that you donâ€™t have a regular place of work. See the section on "no regular place of work." You can deduct the cost of transportation between your home and a temporary work site outside your metropolitan area. The metropolitan area includes the area within the city limits and the suburbs that are considered part of that metropolitan area. That is a question of fact for different communities. The Los Angeles metropolitan area is much larger than that for Modesto. You might try asking the city offices for your city about the boundaries for its metropolitan area. Please explain the exclusion for gifts to a child. Is it an income tax exclusion? No. True gifts without a business connection arenâ€™t subject to income tax. There is a separate federal gift tax, and some states may also have gift taxes. For 2009 and 2010, up to $13,000 of gifts to each individual from each individual are exempt from gift tax so you and your spouse can each give up to $13,000 to a child each year. The gift must be a "present interest," such as a cash gift to uniform "gifts to minors" account. There is a lifetime exemption equivalent of up to $1 million of taxable gifts, so most people donâ€™t pay gift taxes for lifetime transfers. A gift tax return is supposed to be filed by April 15 of the next year when a taxable transfer is made.